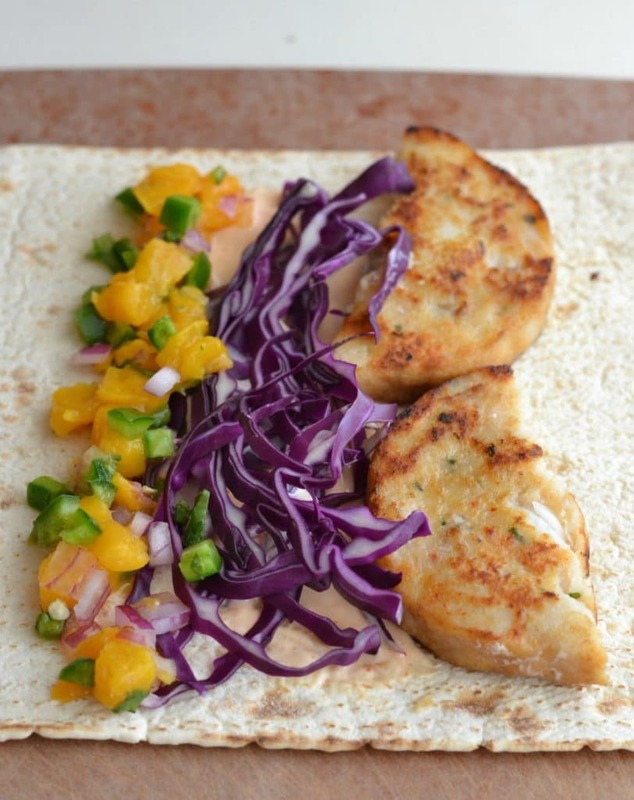 This fresh and delicious fish wrap sandwich makes a perfect light meal for summer nights. 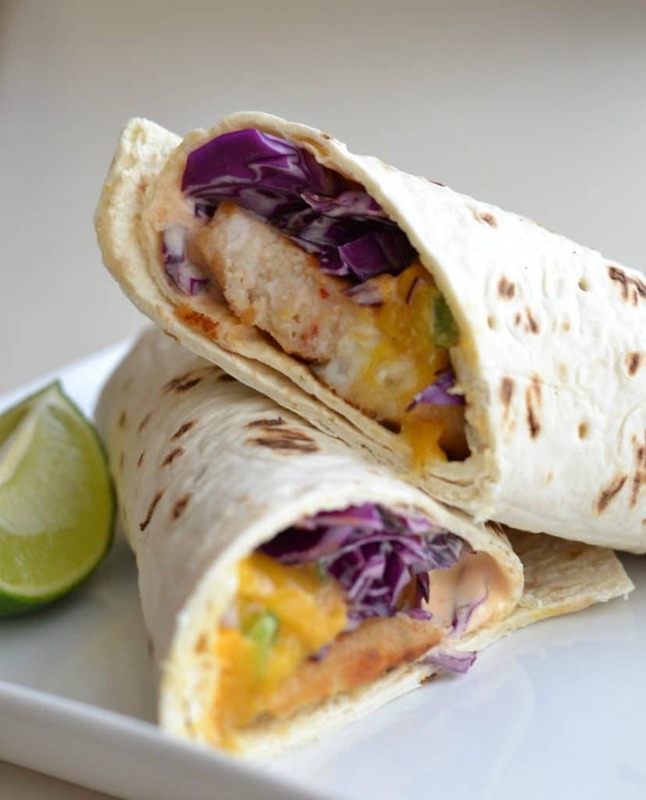 Made with white fish, homemade mango salsa, tangy mayo spread, crunchy cabbage, and avocado, it’s the perfect swap for a hamburger when you want to grill AND eat a light, nutrient-packed meal. When it comes to summer meal planning, I like to make as many dinners as possible on the grill. Not only do I love the charred flavor that the grill gives to food, but I want to keep the heat and the mess out of the kitchen as much as I can. I’ve been wanting to find an alternative to a traditional beef burger that would be just as tasty and easy to prepare, but a little lighter and healthier. So when I saw the Trident Seafoods® Wild Alaskan Pollock Burgers in the frozen foods section at Costco, I had to give them a try. While those ingredients mingled for a bit, I whisked some more fresh lime juice and hot sauce into a little bit of mayonnaise to create a flavorful sauce, and also sliced up some avocado and purple cabbage. If you haven’t had raw purple cabbage with fish before, you’re in for a treat. It just adds a delicious crunch that perfectly balances the delicate texture of fish. When the burgers were done, it was time to assemble the wrap. I used lavash bread for my wraps, but you could also use a flour tortilla, a pita or even some naan. I sliced the pollock burgers into strips, and then added the mayonnaise spread, the sliced cabbage, mango salsa, and some sliced avocado. Wrap the bread tightly round the ingredients, and roll it up. Slice diagonally through the middle and serve! My family really loved this meal, and I found myself craving it again the next day. If you can’t find the pollock burgers, there are many other substitutes you could use instead. I know we’re going to be eating these wraps throughout the summer and beyond. It’s a meal I can feel good about serving and eating, and it’s really simple to prepare. If you make this recipe, please come back and tell me what you think! 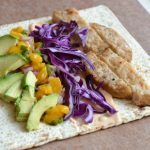 This fish wrap sandwich made from Alaskan pollock burgers is delicious, easy to make and packed full of nutrients. 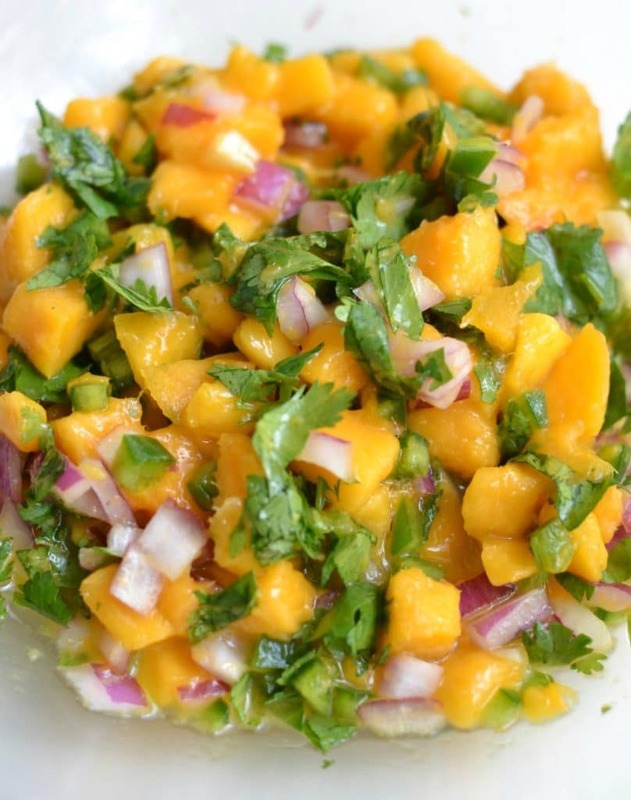 For the salsa, combine diced mango, the juice from 1/2 a lime, jalapeno, red onion, and cilantro. Set aside. For the mayo spread, whisk the hot sauce, salt, and juice from 1/2 a lime into mayo until combined. Cook pollock burgers according to package instructions. Once burgers are cooked, slice each burger into four slices and place on wrap. 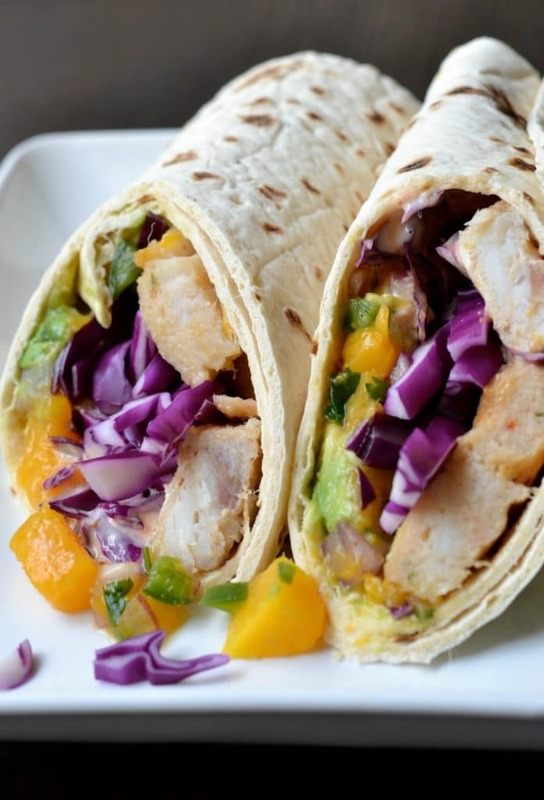 Add some mayo spread, sliced cabbage, sliced avocado, and mango salsa. Roll up and slice on the diagonal. Enjoy! 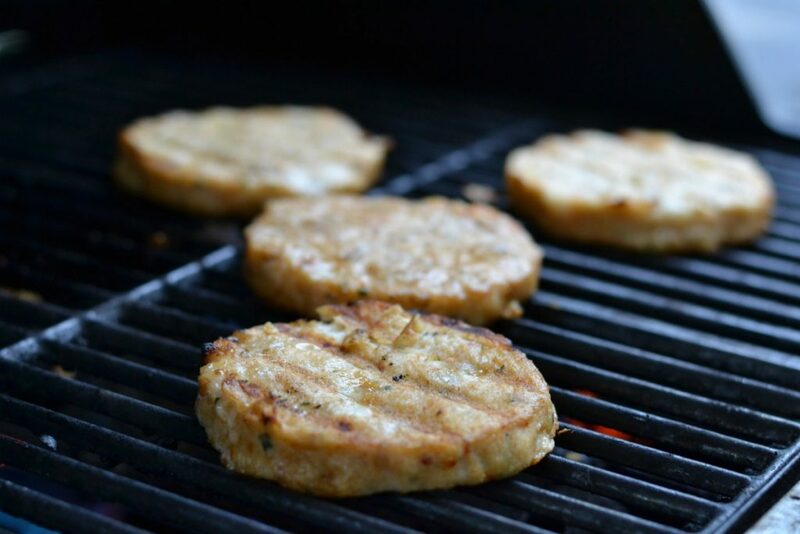 For more delicious and creative ideas on how to prepare Trident Seafoods® Wild Alaskan Pollock Burgers, visit the Trident Seafoods website. You can also find Trident Seafoods® on Facebook, Twitter, and Instagram. This looks so yummm and light too. I love grilled fish and this would be an excellent meal.